Before JPA and numerous East Bay officials finalize the cost of building Coliseum City, they need to understand its scope. How many venues would it hold – 3, 2, or 1? Which part(s) would get built first? How much of it is subject to market forces? 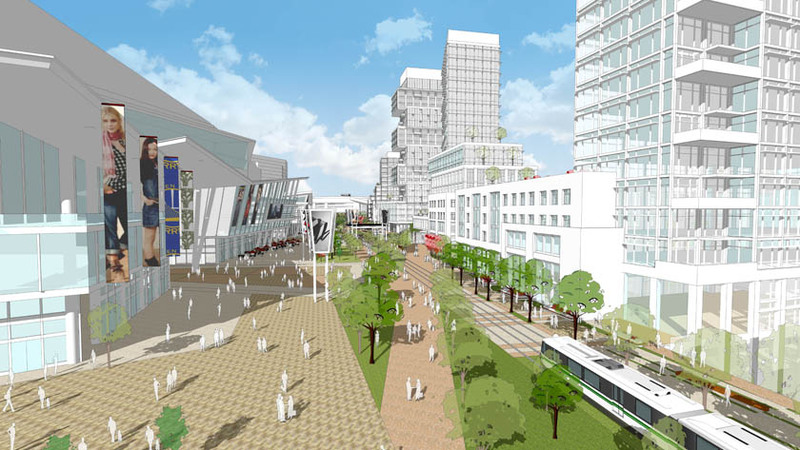 And what of the extra niceties that they plan to put in there, such as the transit hub component? Any project of this size is bound to go through numerous configurations and brainstorming before arriving at the final vision. To understand that, let’s look at some of the renderings released by Oakland architecture firm JRDV. If nothing else, you’ll get an appreciation of how complex this complex is. One of the original drawings has an open-air football stadium, a high-rise hotel, and a hidden baseball stadium, while preserving the existing arena. A look at the plaza between the venues features the mythical trolley, which would run from the BART station to the arena. Honestly, I wouldn’t have noticed if D’Sjon Dixon hadn’t pointed it out himself. The only meaningful difference between the two is that Dixon’s concept is squeezed into a very small lot, whereas there’s plenty of space in the Coliseum’s A lot for a ballpark to stretch out. Naturally, Dixon’s feeling a bit ripped off right about now. For now Dixon is keeping current and future designs under wraps, though it appears as though Glenn Dickey has caught on and championed it to an extent. Chances are that Coliseum City will undergo even more transformations before the parties settle on one vision. If they can’t, or if the project doesn’t prove feasible due to cost, well, at least these were nice renderings (hello, Pacific Commons). This entry was posted in Coliseum, Oakland. Bookmark the permalink. Since the Raiders want to build on the existing Coli site, it would be interesting to see renderings/concepts of a new stadium incorporating the current Mt. Davis structure. Do any such drawings exist RM? 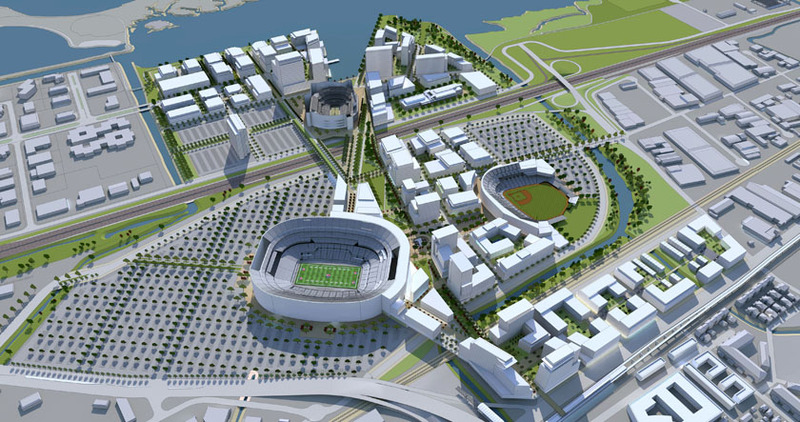 If only then Mayor Jerry Brown had been in favor of such a plan, we could have had long by now new Oakland facilities for both the A’s and Raiders. He had both the political clout and influence to get things done. Unfortunately, Brown had no regard for sports, and didn’t care to understand the positive impact that they had on the economic and civic well being to the Greater Oakland Community. As I’ve said in previous posts: I’m from Oakland, grew up just minutes from the Coliseum. I love Oakland, but I’m not blind. This WON’T work. Not in this part of town. The Coliseum is in one of the most crime-ridden sections of the city. These renderings just do NOT seem cohesive to the surrounding environment. Are big name businesses seriously going to put their stores in a part of town that OPD even avoids? Will fans really stick around after a Tuesday night game to hang out there? Are people really going to come in from all over the Bay Area to patronize the businesses surrounding these stadiums? Oakland needs to scrap this plan and render up a BELIEVABLE concept. One that doesn’t have a plethora of commercial space that we all know will go unused (if businesses aren’t investing in Jack London Square, why in the hell would they invest in East Oakland? ), one that does not include an Arena (I love the Warriors, but they have shown the LEAST amount of dedication to Oakland despite having the best facility of all the teams. Plus, their owner already said they have the “financial wherewithal” to make an SF arena happen) and one that doesn’t have a trolley going from the BART station to the stadiums (I mean, who would really feel like going through all THAT to get to the stadium? Not to mention, who the hell is going to pay for it?). Maybe then, people would actually BELIEVE and anticipate this project. Because as it stands, everyone is laughing at these renderings depicting paradise in perhaps the least paradisiacal neighborhood in the Bay Area. All of that cement sure does not have any personality. 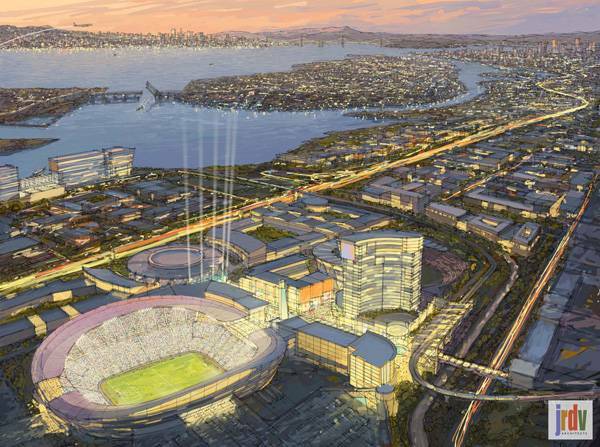 And who is going to pay for Coliseum City? Despite Oakland referring to Coliseum city as “one of the greatest development projects of our time” or something to that effect, the money just isn’t there. It relies on the 3 teams paying their own way and none of them have agreed to do that. Only the Raiders have offered to chip in anything at all. 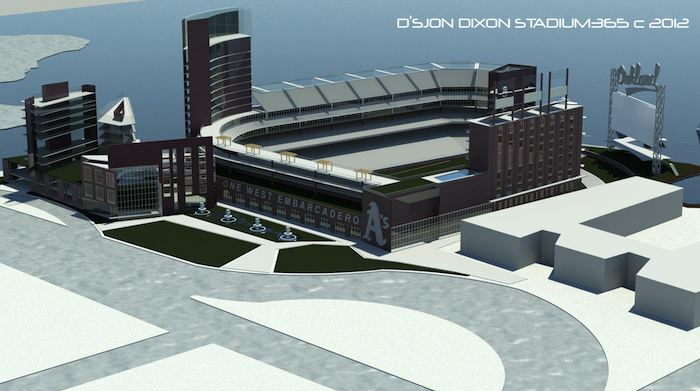 @Tony D – I’m sure the Raiders have such renderings, and they’ve probably shared them with JRDV. Nothing’s been released, though. @Pudgie – It has just as much to do with the shape of the bowl as it does the tower in the outfield. In that sense it’s nothing like the examples you cited. @BayMetro – If it gets built with any serious commercial and residential capacity, there will be private security paid for by the tenants. Comes with the territory. Hey ml. I think coliseum city is allready set up. It has the retail, commerical, business and hotels to succeed….the problem is…its one other side of the freeway. Walmart, the lexus delarship and the other hotels and restraunts are all along hegenberger…the question is how to do shift all the businesses to be closer to Oracle and the Coliseum…or vice versa. Its all right there its just how do u take that whole area and surround it by the sports facilities. 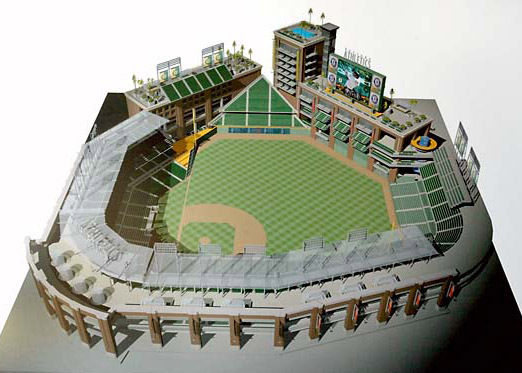 I like the A’s in a ballpark by Coliseum…again Oakland has little funds but if the A’s amd Warriors leave they can convert oraclr into a business or retail area next to the new Raider stadium. What do u think? Thanks RM. Damn Uptown would have been nice! So I guess Coli City would be like a massive gated community in East O, complete with its own security force. It would be a bit of a stretch for anyone to suggest that the placeholder sketch of the Coliseum City ballpark is based on Dixon’s design. @Pudgie – I don’t normally go looking at renderings to see if someone copied someone else. But D’Sjon has a point. Besides, if the ballpark is only a placeholder, why bother changing it? Surely they got inspiration from somewhere. ^this was posted at AN regarding any potential new scoreboard the coliseum may get, my thinking was that it was going to happen but after reading the story above it seems doubtful and the coliseum will continue to have the most out of date “technology” for any venue in the major 4 sports in this country. I have good news and bad news: The good news is Coliseum City is more realistic than Howard’s Terminal. The bad news, is I simply do not see it happening. Why? In New York, there is a process that generally takes two years to complete called the Uniformed Land Use Review Procedure (ULURP), that must be completed in order to START to do Major Construction Projects (unless of course, it is a superseding Federal or State Project). Here in New York, you must wait 150 days AFTER the final approval, to start work. There must be some kind of similar process involved in Oakland (if only because of the need for advanced Engineering Studies and Stress Tests, because of Earthquake threat). There is no way that Quan, Kaplan, Wolff, Davis, Goodell, Selig, The Giants, 49ers, and all the Lawyers involved do not know this. If Quan, Kaplan, and company were serious, the procedure would have been underway already (instead of mentioning Howards Terminal). You mean no one in the Oakland City Government was aware that the A’s & Raiders leases were expiring, and maybe we should get the ball rolling? You mean Jean Quan could not have pushed the envelope like KJ did with the Kings, to overcome the Environmental Review? We all know how the A’s have been screwed by The City (starting with Mount Davis), but (unless this entire exercise is a charade, and the Raiders are leaving anyway?) if I am Mark Davis I would be asking are we as important to Quan & Oakland as the Kings are to KJ & Sacramento? He also knows, that if objective people made a list of the 10 most important and historical NFL Franchises, the Raiders are there, and a similar list of NBA Franchises was made, the Kings are NOT. The continued silence of Groundhog Punxsutawney Phil (oops Jean Quan), would suggest to me for whatever reason (or reasons), we are not. -This “trolly” concept is ridiculous. It looks like a full-scale streetcar system that you’d find in Downtown Portland and would probably cost upwards of $100M. I can see some type of large-scale people mover (basically giant conveyor belts that you see in airport terminals) being feasible. But this trolly idea is just another testament to how out of touch the City of Oakland and the planners are about this project. -I also find it hard to believe that moving the arena across the freeway is logical. Even if the Warriors decide to stay, I find it hard to believe that a large-scale renovation wouldn’t be equally effective and three times cheaper compared to building a new arena entirely. There isn’t money to waste, and if this is happening, the best path to cost-effectiveness is probably knocking out a few walls and expanding the club areas. A new arena isn’t necessary, especially if it’s only going to be used for concerts. -I’m really not buying any of this discussion about a redesigned, football-only Coliseum being built around the existing Mt. Davis structure. For one, the sightlines are absolutely horrible, the first level is largely temporary seating, and it’s not like the suite and amenities up there are particularly modern in the first place. I don’t see it happening. I wonder how san francisco citizens are feeling that this is the last year the 49ers will ever play in city limits again (thx fot nothing gavin newsome)…. and listening to 740 this morning… ed lee is bullish on gettin the Warriors to S.F. It certainly appears the Coliseum will continue with its vintage-1995 scoreboards, since the A’s are not going to sign a long-term lease. In San Jose, the city spent several million dollars on arena upgrades a few years ago, with Chuck Reed emphasizing it was important to keep the building current. The A’s and Raiders, meanwhile, are stuck in a vintage-1960s facility with no relief in sight. This situation benefits nobody but the San Francisco Giants. PJK, I know someone else who may benefit: The 49ers who will own the Bay Area, if Mark Davis moves the Raiders to LA, and if they do (and with the probability of the A’s and Warriors following them out the door). Beyond that, anyone who has the interest to run for Mayor against Punxsutawney Phil (oops Jean Quan), should win in a landslide. Raiders in Oakland forever, A’s in $an Jo$e and don’t really care where the Warriors play AND I’LL BE ONE HAPPY BOY! We keep hearing about how the A’s need to “work with the city of Oakland” on a new stadium. Well, the Raiders have been doing just for a while now and haven’t been able to get a deal done because “working with the city of Oakland” means no public $$ for stadiums in a city where stadiums are not viable without public money. Yeah it does seem the San Francisco/Santa Clara 49ers and SF Giants are licking their chops to fully control all east bay, north bay, pennisula and south bay markets if Oakland fails at Coliseum City….but u know as a Raider fan I am calling Mark davis bluff to move the team….ml do u think mark has the balls like al to move the team for good??? Just a clarification: if Oakland fails at Coli City it doesn’t mean squat re the A’s future in the Bay Area because (being real) they no longer want to be in Oakland. 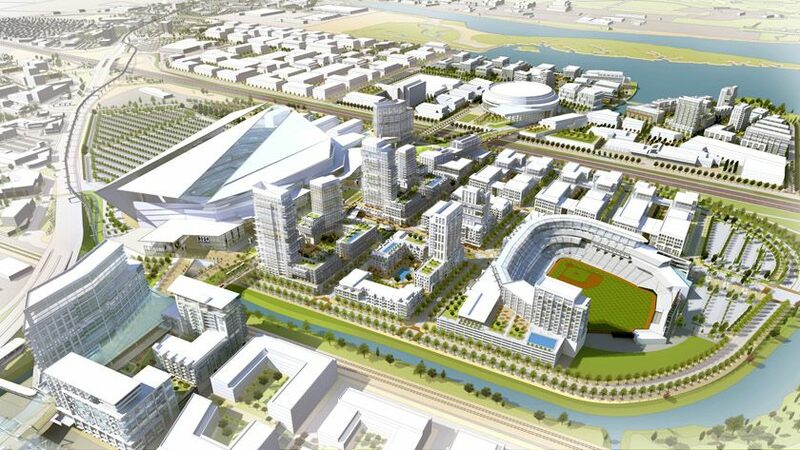 See $an Jo$e and/or Fremont for the A’s future in the Bay. As for Raiders, you might be right re possible failure of Coli City and them leaving the Bay. Meant STILL, not “STULL.” Damn S4! OT – I know a lot of you guy are Raider fans, but I ran across this video discussing the planning which is going into improving the fan experience at Levis Stadium. I think the Niners are taking the right approach, and I hope one day the A’s will have a ballpark in Silicon Valley which will incorporate a lot of these ideas. OakMetro 86, the question is not does Mark Davis have the balls to do what Al did, but will circumstances force his hand? Which is of course, not having some kind of assurance of being able to have a NEW STADIUM at the Coliseum site, or somewhere else in Oakland in a reasonable period of time (say < 5 years). If he does not, then the three less than desirable options kick in: 1: The Coliseum as is. 2: Paying a huge RENTAL fee at Santa Clara, for a indefinite period of time (I think the 49ers and would allow that because apparently the 49ers are not the Giants & even if they were, Roger Goodell is much stronger and more proactive than Bud Selig). 3: LA. I am sure Davis would accept a temporary move to Santa Clara, like Cal did to Candlestick, but since we already know he does not want to go to Santa Clara, or remain at the Coliseum as is, the key word is TEMPORARY. So if the choice is an open ended stay at those two spots (say five years or longer), or Los Angeles, maybe biting the bullet and going to LA is the best of the three bad options. I am still of the opinion we will know the answer by Christmas. breaking news this morning and i’m sure ML will post about it later today but the braves are moving out of turner field and building a new park to open in 2017? wtf? how can the braves get two “new parks in a matter of 20 years while the a’s are stuck at the coliseum for the foreseeable future. Because Atlanta is insane? Pretty much the only explanation I can come up with given their region is building a new football stadium to replace their 20 year old Georgia Dome too. Just hope this new Braves Field won’t start a new run on stadia since as I pointed out the other day, Turner was always very flawed for a modern ballpark. That said I’m sure some teams will use it as justification to replace ballparks that rightly should have had 50 year or more lifespans. I knew it was only a matter of time before one of the so-called modern ballparks gets replaced while the A’s stay stuck in their Lyndon Johnson-era multipurpose stadium. That’s a joke, right? (Re Braves). Or perhaps another game of leverage? If not a joke, perhaps that’s why MLB could be against (or is hesitant towards) Wolff’s plan to completely finance a ballpark in San Jose; would throw a wrench in the Braves plan to milk public funds out of Cobb County for new yard. Turner Field is the Metropolitan Stadium of this era. OakMetro 86 I am happy to help: The problem with spending $300m is this. It becomes a “Lipstick On a Pig” scenario, where it may look nicer, but the structural issues remain. We saw that with the plumbing and the A’s. But more importantly, since this is the Bay Area, making sure that for the next 20 years can the Coliseum structurally last an earthquake, and pass California State Engineering Standards, must be goal number one. This is exactly the point that Cal Berkeley made when they got the permission in Court needed to build their New Stadium. Beyond that, Basically the NFL is not giving $300m and risking seeing the Coliseum in Oakland look like the Coliseum in Rome. This does not even get into politics, “Fairness” “Precedent” or anything else. It doesn’t appear to be a joke. While I’m disgusted with the very idea of replacing a post-Camden park already, particularly when Camden itself has just proven that these parks just need periodic upgrades to stay competitive. Of all the post-Camden Parks I probably would have chosen Turner for replacement first. Still, if Dodger Stadium can be rehabilitated and last over half century, Turner Field should have too. I do not think the Braves Situation is related to the A’s, because the Economics are quite different (such as the Economic State of the City of Oakland). If anything it is just a reminder that the City of Oakland “Leadership” (has fumbled the ball for 20 years when dealing with the A’s and the team needs to get out of jail (oops Oakland)). David, that’s true. There is very little if any correlation. The A’s are trying to move out of a 60’s era multipurpose stadium like the Braves did 15 years ago. The Braves are trying to move out of their near-downtown Camden Yards style ballpark (what the A’s and seemingly everyone else in MLB want) to some suburban ballpark distant from downtown Atlanta. Of course this is in the town where the city built a downtown football stadium 20 years ago and is in the process of building another one while they baseball team is outside downtown and now plans to move even further away. Though speaking of the A’s, someone on another board half jokingly suggested that the the Rays or A’s should move into Turner Field when the Braves leave. Won’t happen of course, but given that Turner is still a very viable ballpark it’s “fun” to contemplate. 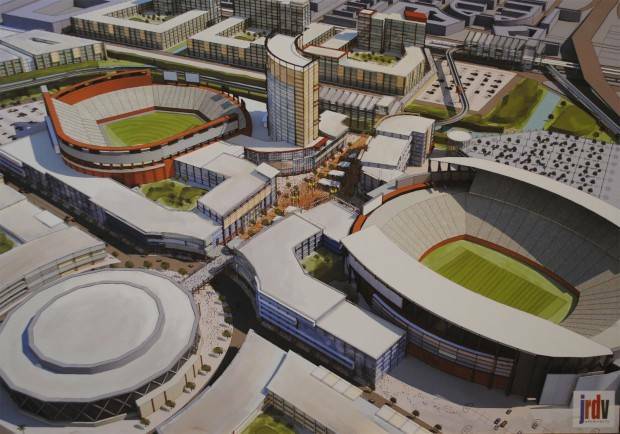 Of course just as likely is that they’ll disassemble Turner Field and move it brick by brick to Oakland or San Jose. 1) $300 million from Raiders. Walla! You now have $7-600 million for new stadium incorporating current eastern structure, including rehab of Mt. Davis. It’s possible. Speaking of money breakdown, looks like the Braves stadium would be built with $450+ million in public funding and only $200 million from the team. @Tony D.: Just my thoughts. The BART bridge deposits fans directly behind Mount Davis, and that’s not where Coliseum City wants its foot traffic to begin and end. If the Raiders stay at the Coliseum, Mt. Davis is coming down because the developers are going to want BART pedestrian travelers to pass commercial retail areas before getting to the stadium. If $200 million from Braves, and assuming the team could get a fat naming rights deal (not even counting sponsorships, possible PSL Sales)…In theory the Braves might pay $0 for new yard (?). Hopefully these images are just markers if not they might need a new artist. The warriors stadium looks pretty similar to the actual renderings from the warriors sf stadium as well. Not sure how your napkin adds up do a deal getting done. Any NFL G-4 (or successor program) money is a loan paid back through club seat sales or a increase in regular ticket sales. Where is the pent-up demand for either? The NFL loves free government money, sure–but they have to look at current suite/club/ticket sales and the prior PSL fiasco and wonder if a shiny stadium in that market/location will matter. If you build it, will they come…with their wallets open?